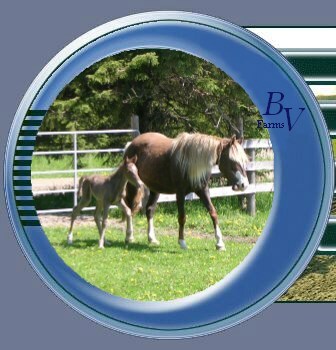 At Bonnie View Farms we have selected our stallions to embody the very best the Rocky Mountain Horse has to offer: an exceptionally calm temperament, excellent conformation, & best of all an incredibly smooth, truly natural 4-beat gait! 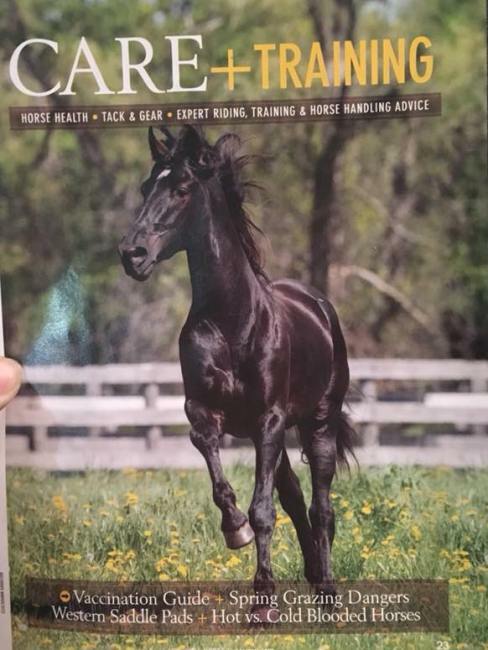 Our amazing stallion Tribute has been invited to be the representative for both the Rocky Mountain & Kentucky Mountain Saddle Horse breeds, as well as the Gaited Horse Group of Ontario, and the Ontario Cowboy Mounted Shooting Association on multiple occasions for many years now. Including at the Spirit of the Horse Exhibit at the Royal Winter Fair, the Ram Breeds Exhibit at CanAm Equine, and many others!! Our stallions Tribute & Jedi are also Cover Boys!! 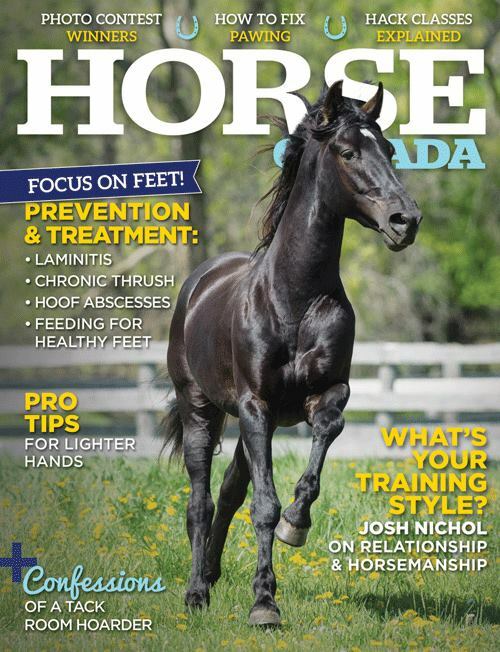 Horse Illustrated (August 2015) & The Trail Rider (June 2016), and Jedi has been in Horse Canada magazine (March/April 2017 & 2018) twice now!! Tribute is our handsome double certified RMHA/KMSHA stallion, (DOB 4/18/09). He has a dappled dark chocolate coat, with a snow white mane & tail. Tribute stands 15.1hh, with a powerful, compact build. Tribute is exceptionally calm and quiet; you would never guess he is a stallion! At only 2.5 y.o. he performed like a seasoned pro at the Royal for the first time; his first ever trip off the farm! Tribute is sweet, gentle, and so very loving. His bloodlines include “Sewell's Sam”, “Sam Clemon's Tim”, “Dock” and “Tobe”. Tribute has text book conformation, and is an incredibly strong & natural gaiter! 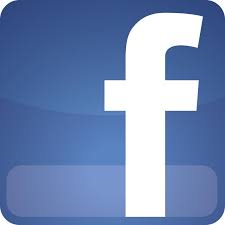 Check out Tribute's , 's ! 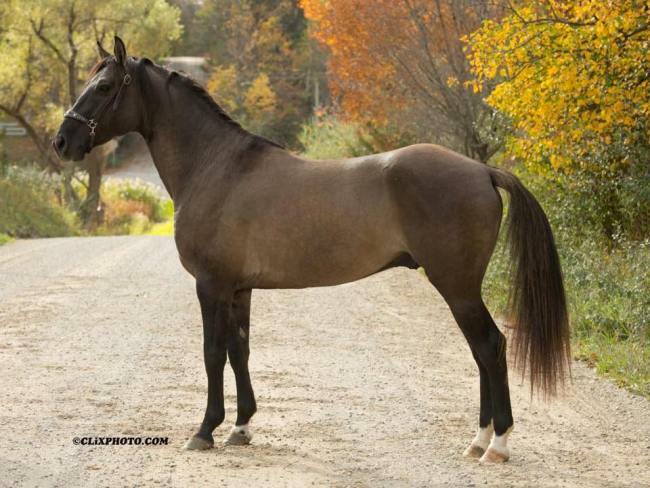 Jedi is our gorgeous double certified RMHA/KMSHA stallion, (DOB 3/12/08). He has a jet black coat, with an incredibly long, thick, wavy, mane & tail. Jedi's mane is over 36" long! Jedi stands 16.0hh, with a large, powerful build. He has a sweet, friendly personality, and lots of curiosity too. Jedi is also an exceptionally bombproof trail horse; absolutely nothing phases this guy! Jedi's sire is the legendary stallion “Dock”. His brothers include the famous “Choco Dock”, “Joe Banjo”, “Let's Tango”, “Rockin Dobbin” and so many others. 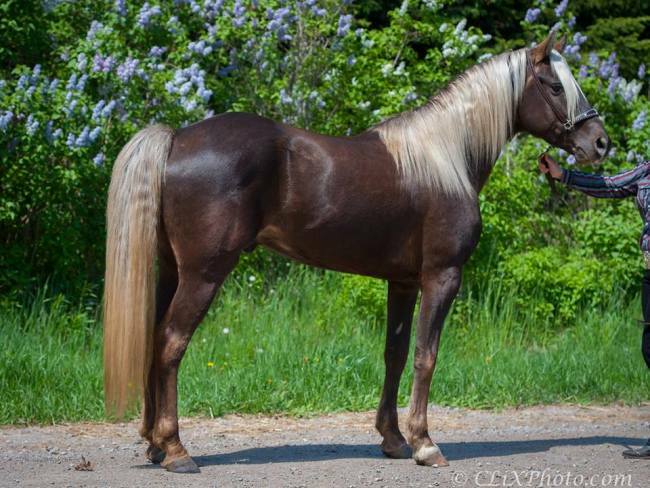 Jedi has excellent conformation, and sets the bar for naturally gaited. Jedi is our gaiting machine, and what an incredibly smooth & truly effortless gait it is too! Check out Jedi's , 's ! 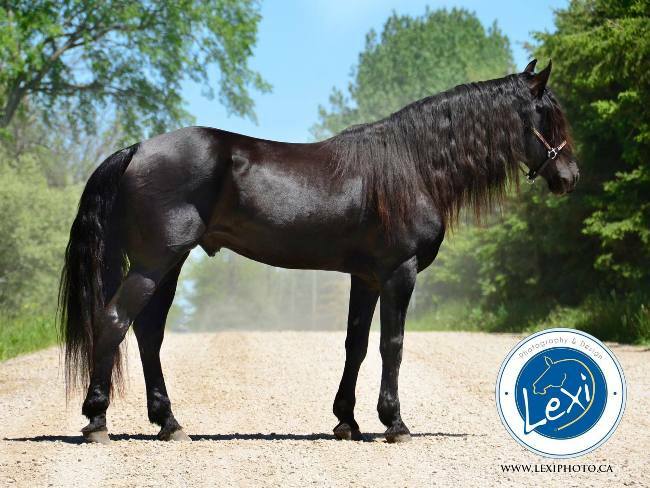 Remi is our gorgeous double certified RMHA/KMSHA grullo (black dun) young stallion, (DOB 4/20/13), a very rare colour in the Mountain Horse breeds. He will mature around 15.0-15.1hh, with a compact, muscular build. Remi is beautifully put together, with textbook dun markings; including a dorsal stripe along his back and zebra striping up all four legs. He is super calm, gentle, and loves to please. Remi is also very inquisitive, and extremely friendly too! His bloodlines include “Ramblin Rex”, “Sam Clemon's Tim”, “Dock” and “Tobe”. This gorgeous boy is definitely an eyecatcher!